About 13,000 years ago, when the last ice age was in full retreat and Britain was still joined to mainland Europe, the peninsula which we now know as Cornwall would have been one of the most inhospitable regions of the western world. A severe climate, near-arctic conditions and a landscape resembling a polar desert would have made vegetation growth impossible, and another 3,000 years had to pass before the gradual rise in temperature allowed the slow advance of first scrubland and then forest. It was at this time, during the Palaeolithic period, that the first inhabitants began to arrive, although we know very little about these very early pioneers in Cornwall. Indeed, the pattern of human activity only begins to clear after about 7000 B.C., when we can envisage a Mesolithic population of hunter-gatherers moving from place to place in search of migratory animals like red deer and wild pigs and in spring and autumn exploiting the resources of the sea as shellfish and whitefish made their seasonal incursions into coastal waters. At Trevose Head, on the north coast, archaeologists have identified one of the county’s most important and productive Mesolithic sites which yielded evidence of perhaps 6,000 years of prehistoric activity. Over 800 flints were recorded and the scale and variety of the finds reminds us what they were put to a multitude of uses, scrapers for skin and hides, weapons for hunting, and tools for collecting and breaking open limpets, mussels and other varieties of shellfish. With fruit and berries also forming an integral part of their diet, these early inhabitants had clearly proved adept at exploiting the diversity of the natural resources available to them. During the fourth millennium B.C. this Mesolithic lifestyle was transformed by the infusion not only of new technologies but of new blood as fresh colonists moved westwards from southern Britain, bringing with them a knowledge of pottery manufacture and, more importantly, agriculture. This progression into what is termed the Neolithic period was characterised by the introduction of both arable farming and animal husbandry, practices which gave rise to the fundamental innovation of permanent settlements. Several archaeological sites have provided evidence of Neolithic activity in Cornwall, like Poldowrian on the Lizard and Bodwen near Lostwithiel, but Carn Brea near Redruth has recently proved to be the most revealing. Here a two-acre/0.8ha hill-top enclosure, part of a settlement pattern which had been established throughout northern and western Europe, was found to contain a number of timber huts while on the southern slopes beyond the defences indications were also found of field clearances and cereal cultivation. Detailed examination also produced evidence of long distance trade while a hint, perhaps, of the tensions of Neolithic society was provided by the discovery of an unusually large number of arrowheads, which suggests that the community was periodically called upon to defend itself against the attacks of unfriendly neighbours. 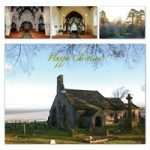 With the advent of permanent settlements came another development, the construction of monuments which today are mainly to be found in moorland areas where they have been able to escape from the consequences of later agricultural clearances. Among the most distinctive features are the Penwith chamber tombs, a type series found all over Cornwall but named after the area in which they were first recognised. These structures, which seem to have been much more than mere burial mounds, probably fulfilled a number of ceremonial and territorial roles. While they vary in form, the basic model consists of mighty upright slabs, or orthostats, capped with a large, flattish stone, although archaeologists no longer accept the previously held view that they were originally covered with an earthen mound which was subsequently eroded by the elements. Fine examples of these monuments, variously known as quoits, cromlechs and dolmens, can be seen at Zennor, Chun and Lanyon in the far west of the county. About another dozen quoits have been identified elsewhere but the fate of the Devil’s Coyt (a dialect spelling form) near St Columb Major, enterprisingly used as a pigsty until it collapsed in the 1840’s and then as a source of hedging stone, reminds us that they were probably much more numerous, like countless other types of early Cornish monuments. The chamber tombs and the immense human effort required to erect them suggest that society was developing an important degree of organisation and cohesion. This increased stability also seems to have contributed to a growth in population and even possibly to a certain amount of land pressure as the unsophisticated methods of land utilisation were no longer capable of supporting the growing numbers. In west Cornwall, at least, this development may well have become pronounced by the end of the Neolithic and Professor Charles Thomas, in his recent study of the Isles of Scilly, has advanced the view that this factor lay behind a planned colonisation of the islands by land-hungry emigrants from the Penwith peninsula. During the early part of the second millennium, c. 1800 B.C., Cornwall was host to a new group of settlers known as the Beaker folk who were associated with a distinctive style of reddish brown decorated pottery and greater variety of burial practices. The Beaker homeland lay on the continent, although in Cornwall’s case they may have arrived indirectly via Wales and Ireland, bringing with them a specialist knowledge of mineral working. They smelted copper for axe heads and matched it with tin to produce a superior alloy, bronze, and archaeologists interpret the arrival of this new technology as signalling another era in prehistory, the Bronze Age. Weapons, tools, pottery and other implements became more sophisticated while burial rituals were more diverse. Barrows of earth and stone were favoured and these survive in large numbers on upland areas like Bodmin Moor and St Breock Downs, along with stone cists in which cremated bones and various grave-goods were deposited. An excavated cist at Gunwalloe on the Lizard yielded three pots of human ashes as well as the unburnt bones of a young rabbit, a toad and three birds. A major problem with the Bronze Age in Cornwall, and as we have seen it is one shared with earlier periods, is that many sites have been destroyed by centuries of agricultural and mining activity. During the past 20 years, however, several key excavations have made important contributions to our understanding of this period. At Trevisker, near St Eval, detailed examination identified a community which lived in circular wooden huts, kept livestock like the horned oxen and also engaged in some arable cultivation. At Stannon Down, St Breward, a hut circle settlement has been excavated and along with it an associated system of rectilinear and curvilinear fields, while at Gwithian near Hayle the community worked small, square fields which were hardly much bigger than modern allotments. All this points to a great increase in farming throughout Cornwall and to a settled society working its permanent fields and fixed grazing areas. Important trading links had been established with other coastal regions like Brittany, Wales and Ireland, and this led to the gradual acquisition of more ornate goods and implements such as the bronze rapier dredged from the River Fowey, the nine gold bracelets unearthed from a field boundary at Amalveor near Towednack, and the very rare bronze saw which was discovered at St Mawgan on the north coast. This stability also seems to have been a key factor behind an increase in megalithic or monument-building activity which was primarily directed towards the construction of stone circles, a practice which had its roots in the Neolithic but accelerated during the early Bronze Age. There are nearly thirty of these stone circles in Cornwall with the greatest concentration on Bodmin Moor and in the far west. Some four miles/6.4km north of Liskeard stand the Hurlers, three adjacent circles lying on a N.N.E.-S.S.W. axis, while in the west the better known examples include Boskednan, Tregeseal, Boscawen Un and, above all, the Merry Maidens near Larnorna. Even the most cursory glance at any of these monuments would be enough to remind us of the vast amount of human effort which must have gone into their construction, so much in fact that many theories, some pure fantasy, others quite logical, have been advanced as to their original function and significance. An earlier generation of antiquaries, like the 18th-century Cornishman William Borlase, linked them with mysterious, druidical ceremonies conjured up images of eerie rituals and sacrifices. Others have linked them with astronomy, pointing out that many are often aligned other circles as well as with the sun at solstices, and accordingly have accredited their builders with a sophisticated knowledge of mathematics, of measurements like the ‘megalithic yard’ and an understanding of the movement of the planets. Modern authorities, however, like Aubrey Burl and John Barnatt are more sceptical and take the reasonable view that these circles were essentially meeting places, focal points for ritual, worship and perhaps even economic activities. Several other types of Bronze Age monument forms can also be found in Cornwall, although providing a satisfactory explanation of their original function is another matter. Standing stones, or menhirs, which are again concentrated in Penwith where some bear curious musical names like ‘the Pipers’ and the ‘Blind Fiddler’, remain difficult to interpret, although another group, the Entrance Graves or chambered cairns of Penwith and Scilly, are now seen as structures associated as much with ritual and fertility as with burial. Indeed, the more archaeo­logical knowledge advances, the more we are inclined to envisage all early monuments as having fulfilled not one but a variety of territorial and spiritual functions. By the end of the Bronze Age, c. 800 B.C., there are indications that the climate was deteriorating, and certainly the soil conditions on the higher moorland areas were causing concern with the spread of peat. In Cornwall this trend brought about changes in the distribution of population as Bodmin Moor and similar upland zones were gradually abandoned in favour of the warmer and more fertile lowlands. This process was contemporary with major advances in metal working as knowledge of iron manufacture was spreading throughout Britain. The first indications of iron working came from the Black Sea region and particularly from the province of Anatolia in modern Turkey. The new technology swept across a Europe which was in the throes of tribal conflict and large scale migrations, and of these restless peoples the most important from the Cornish standpoint were the Celts. The Celts were a warrior society initially distinguished by their habit of burying their dead in urns in level cemeteries and from c. 1200 B.C. they had begun to spread westwards from their homelands in eastern Europe. At Hallstatt in Austria archaeologists have carried out extensive excava­tions of a large cemetery and substantial salt workings, the use of a salt as a preservative being a practice particularly associated with the Celts. As these people became more sophisticated a more developed social order was established and by 500 B.C. their economic and spiritual worlds had become quite complex. The La Tène Celts, as these later tribes are known after an important site in Switzerland, were techno­logically advanced, skilled workers in metal and wood, and efficient traders with their Greek and Roman contemporaries. 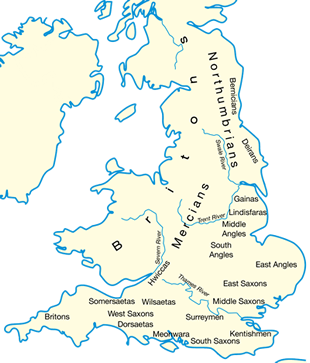 Britain, meanwhile, was developing her own Celtic culture as increasing contact with the continent brought new influences, and running parallel with this marked increase in trade was a long period of piecemeal Celtic colonisation which began in the seventh century and which then accelerated in the first century B.C. The newcomers were gradually assimilated into the native Bronze Age population and from this fusion emerged a number of dialects from which the Cornish language is ultimately descended. In Cornwall evidence from this period is fairly substantial and over 600 Iron Age sites have been identified, many by aerial photography and the analysis of crop marks. It is clear that the typical settlement was the Round, a circular or sub-circular enclosure defended by a single bank and ditch and containing stone or wooden round houses and outbuildings. Beyond these defended farms lay the fields, now completely obliterated in lowland areas where they are recognisable only by cropmarks of ditches. In Penwith, as at Bodrifty near Penzance, the associated fields remain as stony banks or field walls which are maintained to the present day. Among the most recent examples to have been excavated was the smaller Threemilestone Round near Truro where an area of c. 3,000 square yards/2.508m was enclosed by a 10-ft/3m. bank and ditch with two further smaller ditches beyond. In west Cornwall, again, another settlement model was the ‘courtyard house’, a form which has a counterpart in north-east Wales with the ‘enclosed homesteads’ of Gwynedd. 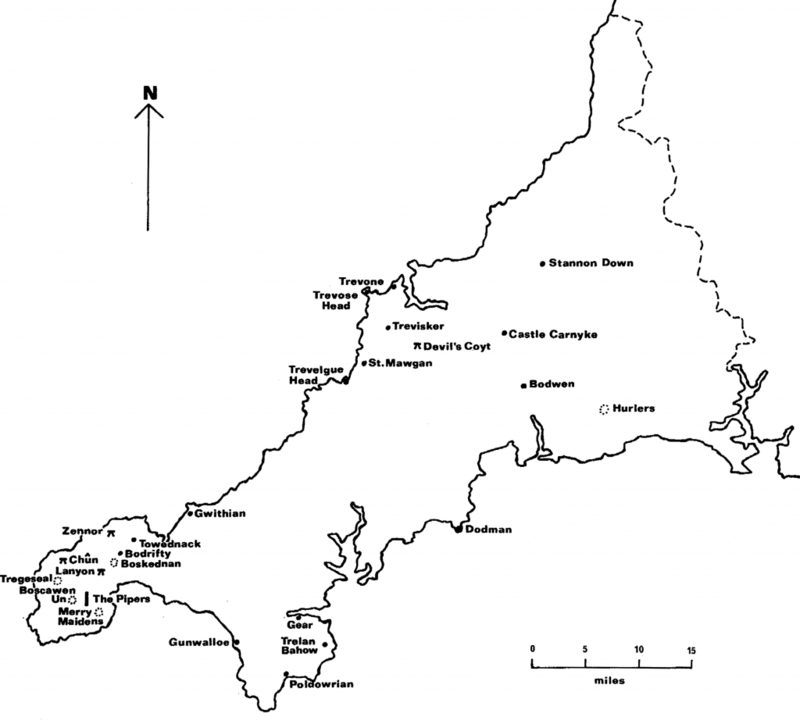 Prehistoric Cornwall, showing sites mentioned in the text. At Chysauster, a village of at least ten courtyard houses, a typical house had a central courtyard surrounded by dwellings and storerooms set within a formidable stone wall. The courtyard house village at Cam Euny, also in Penwith, contained three main houses which have been excavated and the site appears to have been occupied for at least 700 years during the early Iron Age and Roman periods. These communities, and many others like them, established their associated field systems, clearing away surface stone to make small permanent fields enclosed by dry stone hedges. Sadly, much of the Chysauster field system has been recently bulldozed to meet the needs of modern farming, but on the uplands around Zennor it is still possible to look down on a remark­ably well preserved Iron Age agricultural landscape. Of burial sites, Harlyn Bay is the most important. Excavation of this cemetery between 1900-5 revealed 130 slate-lined graves or cists some 15 ft/4.5m. below the sand surface, and some of them contained Iberian brooches which indicate trading links with Spain. Another burial site was located at Trevone, while at Trelan Bahow near St Keverne a grave of an obviously important female was found to contain some, at least, of her worldly possessions including rings, bracelets, brooches, a necklace and a bronze mirror. The Iron Age communities were also great builders of hillforts and many of these defended structures can be found throughout Cornwall. 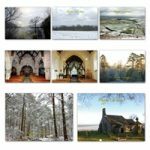 One of the most impressive examples is Castle-an-Dinas, situated in the upland area mid-way between Penzance and St Ives and less than a mile/1.6km from the settlement at Chysauster. With an overall diameter of 436 ft. (133 m), this hillfort had four lines of defence while recent surveying of the surrounding slopes revealed evidence of a complex patchwork of small, irregular fields worked by the inhabitants. At Chun Castle in Penwith the ramparts were said to have been 15 ft/4.5m. high until they were robbed during the 1840’s to provide stone for the construction of the new north pier at Penzance. Other substantial hiliforts include Castle Canyke near Bodmin and Gear on the southern side of the Helford River. In addition to hillforts, over twenty cliff castles have been identified around the coastal promontories of the county. These were fortified headlands defended across the ‘neck’ by one or more ramparts, and appear to have fulfilled a variety of economic, defensive and settle­ment functions. Fine examples include Trevelgue Head near Newquay, the Dodman near St Austell and Chun Castle east of Porthcurno which also sports the famous ‘Logan Rock’ perched on top of a rocky outcrop within the fort. Another feature associated with the Iron Age in Cornwall were the fogous, a term derived from the Cornish word fogo meaning a cave. These structures have their equivalents in Brittany, S.W. Scotland and Ireland and amount to underground passageways roofed with large granite slabs. While they are to be found as an integral part of small settlements their original function is unclear and suggestions have ranged from storage chambers, places of retreat during times of attack, or perhaps they were linked with worship and spiritual matters. As Cornwall entered the first millennium A.D. it is quite evident that the regional economy had become much more developed and diverse. Farming, fishing, pottery manufacture, salt and metal working all played their part while tin, particularly, had already become the subject of a flourishing trade with the Mediterranean world. Other important maritime connections had been established with Ireland, Wales and Brittany, regions which were to make an increasingly important contri­bution throughout and well beyond the approaching centuries of Roman authority.